The Asus Transformer Prime has leaked here and there, and expectations for what is shaping up to be the first quad-core tablet coming with Nvidia Tegra 3 united around it featuring Android 4.0, Ice Cream Sandwich, the latest version of Google’s mobile platform, from the get go. ICS, though, might come as an update to Honeycomb, which will be initially pre-loaded on the slate, according to a picture posted by Asus Germany. The Asus Transformer Prime showed up on images in the wild in the same successful form factor with a keyboard dock. 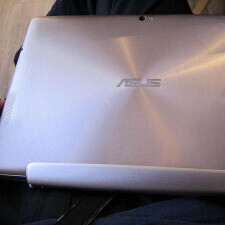 The prime is styled to match Asus’s latest Ultrabook offerings with a shiny metallic body. The 10.1-inch Transformer Prime also has a pretty slim keyboard - only 0.33" (8.3mm). Don’t expect any exact dates for the update, because Asus isn’t revealing any of that. What seems certain though is that the Transformer Prime and the first-gen Transformer will get spiced up with Ice Cream Sandwich only after the company’s Padfone arrives. And the Prime itself? The most likely release date for it is in early 2012. Hey this is a quad-core tablet. I don't care that it comes with Honeycomb. That is fine, Asus updates their products quickly. Ice Cream Sandwich is guaranteed so I am very happy with that. When I get my Asus Transformer Prime, I will root that beast have my fun & by then the Android Ice Cream Sandwich will come out. I just can't wait for this tablet! im so sick of these rumors. the apple rumors are even worse. pure speculation. how about some facts PA? how about an article without words like "seems", "might", "appears", "expected", "maybe", or "perhaps".